In the video series above, Dan the Man with the Master Plan introduces us to Lou Corona, a 58 year-old who looks about 40 and has the strength/energy of a 20 year-old athlete. 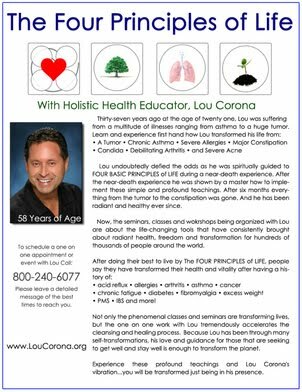 At the age of 21, Lou was suffering from a myriad of health problems including: Candida, chronic Asthma, Arthritis, severe Allergies, and a huge tumor on the back of his neck. 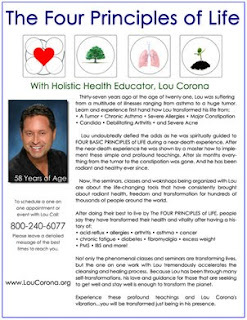 Having given up on life, Lou clinically died for a short period of time and had a Near Death Experience, during which he was spiritually guided on how to cure his diseases, regenerate his body, and rejuvenate his vitality. He did this through 4 principles he refers to as cellular communication, cellular environment, cellular exercise, and cellular nutrition. After 6 months on this regiment of breath-work, yoga, forgiveness, positive-thinking, and eating 100% raw vegetarian living foods, he was cured of all his ailments. Now, 37 years later, Lou still lives according to these principles and shares them with us here. Mental: Realize we are spiritual, electrical, unlimited beings. Every experience is a lesson and an opportunity to learn and grow. Prayer, meditation, and communication between the self and the Higher Self is one of the most valuable tools to have to live a GREAT LIFE! In each moment we have the choice to love or hate, condemn or encourage, destroy or create. Once we make a declaration to live an incredible life, that declaration then can begin to govern our life. So it's important to ask ourselves, how do I want to live? What am I committed to? How do I want to feel and think? What do I want to believe? 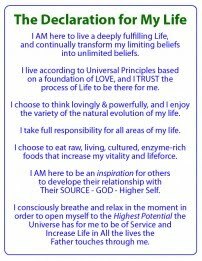 How do I want to conduct my life? Sun - Sunlight on your body, 30 to 60 minutes a day for vitamin D, detoxification and more energy. Be aware that if your body is still toxic to go slow with it. Once the temple becomes more lean, clean, and serene, the more you will be able to sun bathe without any ill effects. Skin Cancer is simply toxins coming out of the skin. Air - Fresh air, long, slow deep rhythmic breathing for detoxification, energy, clarity, peace, harmony, inspiration, balance and strength. There is more to the air than just the oxygen. The ancients have known for thousands of years what scientists are now proving to be an unlimited amount of potential energy existing between the particles that we can see with our naked eye. This energy is called prana, life-force, spirit, chi, ki, kundalini, and so on. Water - Visit the ocean, drink pure, alkaline, antioxidant, structured water at your best. If you have access to geothermal water created by Mother Earth you are in good shape. However the next best step is to get a powerful ionization device with proper filtration. Earth - Walk in nature, eat plants from organic, mineral and enzyme rich soil to balance the electro-magnetic matrix of the human body-system. Just standing directly on the Earth without shoes or socks and being present to your breath and the elements around you can recharge your body energy. "A common popular etymology claim is that the word is derived from "hāʻole", literally meaning "no breath". Some Hawaiians say that because foreigners did not know or use the honi (the Hawaiian word for "kiss"), a Polynesian/Hawaiian greeting by touching nose-to-nose and inhaling or essentially sharing each other's breaths, and so the foreigners were described as "breathless." The implication is not only that foreigners are aloof and ignorant of local ways, but also literally have no spirit or life within." what I needed. GOD BLESS!!! Thanks for the comments guys. We've been on the raw food for over a month now and we're feeling lighter, happier, healthier, and much more energized (need less sleep at night, and never take naps during the day anymore too). We've also switched to drinking purified, alkaline, anti-oxidant water (BioCERA filtration) which has made a huge difference. We've been vegetarian and doing yoga/martial arts for a long time now, but those are also very important factors towards optimal health. As for the breath-work, it is certainly quite the internal workout, the effects of which are instantly noticeable. We've only been able to do about 10 minutes a day, but we're working towards Lou's recommended 30. Just doing 10 minutes a day though, I'm feeling much more core strength in the abdominal area and my 6-pack is getting real tone/definition. Also the psycho-spiritual effect is making us much more tolerant/compassionate towards certain types of negativity we'd been dealing with. To do the breathing correctly, sit comfortably with a straight back and breathe in slowly through your nose bringing the air low/deep into your diaphragm and letting it expand like someone's pulling a string attached to your belly-button. Once you've taken the deepest, slowest breath possible put your tongue to the roof of your mouth and hold the air in as long as possible. During this time you will feel moments of light-headedness, euphoria, and your heart will start beating much more strongly from all the oxygen it's receiving. Once you've held the air as long as you can, slowly exhale through your mouth pushing every last bit of air out by clenching your abdominal muscles tightly until your lungs are empty, then sit like that with a clenched stomach and no air as long as you can. When you can't hold it any longer, take in a new, slow, deep breath through the nose and repeat the process. Peace and blessing to you and yours, keep the TRUTH coming!!! Congratulations Alicia! Good luck and keep it up. Eating raw, vegetarian, enzyme-rich, life-giving foods is an absolutely necessary step towards optimal health, energy, and happiness. As you mentioned, fasting/detoxing is another necessary step. If you're serious about changing your diet and getting radiantly healthy, you have to go "out with the old, and in with the new." There's rotting meat, parasites, and chemicals in every former meat-eater's colon which are never expelled unless you do a long-term water fast and/or a colonic procedure. It is also quite the spiritual experience to go without food for several days, not easy to do, nor something to be taken lightly, but highly recommended and you'll be glad you did it. If you're constantly eating everyday, your organs are constantly working on digestion and never get a break. When you stop eating for a while, your organs get to rest, and while they're resting they do a bit of spring-cleaning by flushing out all unnecessary fluids/solids. Now, I don't want to get too graphic here, but I want to get my point across: When you haven't eaten anything for several days, and you expel the heaviest, darkest, smelliest poo in your life, you know that all that was rotting inside you and to clean it out of you is the most freeing, light-body feeling, it will be the best poo of your life. Ok, sorry about that, but I had to say it, because everyone has that toxic poo inside them wanting to get out, but never stop eating long enough to give their organs a break and cleanse out their colons. "Increasingly I have been finding evidence that Alex Jones, like many other 'truth' movement heroes, is not really what he seems." Bingo: I think so too, for example. Meanwhile, I'm even calling him an instantaneous water heater who integrates everything into nothing – an almost complete waste. Greetings from the german heartland and please keep on writing! Thanks, Eric - one of your best posts yet! I am finding your blog to be a continual source of inspiration. The message about the water is so true...I live in Saratoga Springs, NY, and we have healing waters flowing freely in several areas of the city. In fact, the natives turned the whites on to the waters over 200 years ago. It's a shame that the city is now more known for it's bars and party scene! Eric, you have one of the most awesome blogs I've ever visited.. Real non-corporate-controlled news, life-saving health information, esoteric insight, etc. I gotta buy you a beer next time I'm in Thailand because you are awesome. Keep up the good work, my G.
Eric, where do you find organic, raw, living foods and good water in Thailand? I'm always frustrated with the health food options when I'm in Asia. Wow, thanks so much for those comments guys. For David, I bought a BioCERA anti-oxidant, alkaline, water purifier so that keeps my water clean and structured, and there are 2 raw, organic restaurants here in Bangkok, plus plenty of organic produce which we've been turning into some interesting and delicious raw recipes. We have lots of papaya salads, cucumber salads, pomello salads and fruit salads when we go out, or eat the salad bar at Sizzler etc. When we stay home we've been making a variety of things ourselves like raw sushi, using chopped water chestnuts for rice, wrapped with carrot, tomato, and avocado. It's cheaper, healthier and tastes better than the Japanese restaurants we used to frequent. Peace. Hey, guys. I found this for structured water. It's almost the size of a water bottle cap so great for travel. Any thoughts? Eric, can you direct us to any resources on how to do a proper cleanse? This alkalizes the water to about pH 9, and you can taste the crispness, odorlessness, and feel the improved hydration... I drink half as much to feel twice as hydradted as before. As for cleansing, I've just recently bought an enema kit but haven't tried it yet. So far the only real detoxing I've done is water fasting which I'd highly recommend. Good luck and good health! Peace. Hey whats up Eric and everyone? LOVE the site and very true, raw vegan is definitely the healthiest diet and best for the soul. Besides that, i have heard and witnessed infromation about electrolitically reduced water. In other words, Hydrogen rich water. From the research i have currently, my understanding is that water these days is polluted and contains very low amounts of hydrogen. H2o means 2 hydrogen and 1 oxygen, however the case todays is that almost all water currently on earth barely contains active hydrogen, which has kept life healthy up till the start of the NWO. Today health is at an all time low, for life on earth. Indivual scientists from Kobe,Japan and a couple places all over the world are interested in (active)hydrogen rich water. My understanding is that this water basically is what humans have needed for hundreds of years if not longer, which is water that doesnt just keep us alive, but keep us getting healthier, which doesnt seem to exist anymore. The conclusion is THAT THE WATER(ELECTROLITICALLY REDUCED WATER) CAN BE ARTIFICALLY MADE WITH A MACHINE. THE REASON THIS IS IMPORTANT IS BECAUSE WHEN ALOT OF ACTIVE HYDROGEN IS IN WATER IT CAN BASICALLY PURIFY AND ENHANCE YOUR CELLS, BASICALLY CAN CURE EVERY DISEASE! IT IS THE FOUNTAIN OF YOUTH! DONT BELIEVE ME IVE SEEN PROOF IN REAL LIFE, SUCH AS PEOPLE AROUND AGES OF 170 YRS OLD. DO SOME RESEARCH, TLACOTE WATER IS A PERFECT EXAMPLE, type it on youtube and a ten minute video will say what im saying as a visual, pretty amazing stuff, seems like THE NWO's main weapon is our water! RESEARCH OR YOULL REGRET IT... THANK YOU, PEACE, LOVE, AND REVOLUTION! Open your minds to the largest conspiracy that has changed the world the most... (I am not trying to scare you, i am only trying to open your mind).Common water is no longer healthy. Disease did not exist before water became mis-used (they do not teach this in school)!!! Most people have been chronically dehydrated for generations and centuries all around the world. Common water does not contain its natural components anymore. Water is processed/ pumped/ shipped/ added harmful chemicals and minerals, and it is sold all around the world. Common water does not contain it's natural components (Active hydrogen and aquaporins). Common water does not hydrate us like it should, we only get the bare minimum to survive! This is by far the largest conspiracy that has existed in human history and us people need to figure out our priorities. There are natural water sources around the world. Eat organic, dairy is unhealthy, limit artificial sugar, excercise, dont get shots/medical drugs (theyre crap), and you can become healthy or stay healthy. This is legitimate! Solutions are bound to find people who make bad health a problem, thank you.